Dan was quick to dismiss the observation, insisting all was friendly between the former footballers. As if to prove the point, he also shared a behind-the-scenes pic of the pair in the studio together, Martin holding up his pad which was covered in covered in scrawled notes. Mark could be seen scrunching up his face in the background. “The Keown notepad,” Dan captioned the picture. 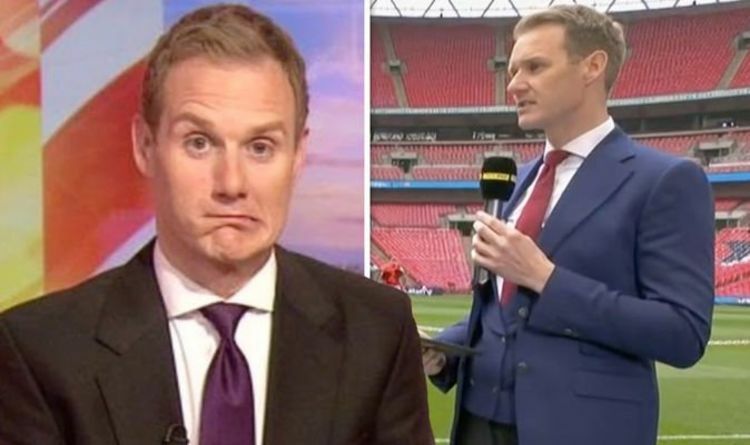 On Friday night, the BBC Breakfast presenter asked fans for help as he stayed late in the office to prepare for Football Focus the following day. Sharing clips with his 71,000 Instagram followers on his story, he said: “Hello everybody, just getting ready for Football Focus tomorrow. “In the office, got the golf on, got the football on,” he continued, panning the camera to show the two different sports on two different computer screens. “Got some Mini Eggs, got some mango for some reason. “Friday night is snack night,” he quipped. Holding up a big bag of Cadburys Mini Eggs, he added: “Just got an important question: how many is too many? “I went for the family pack, there’s an awful lot in there. I think I’ll get through these. “I don’t want to be too much of a pig, so what would be an acceptable amount of Mini Eggs?” he asked fans. He later uploaded another clip, saying he had received questions about how many people were in the office to help him make his way through the bag of chocolate eggs. ‘A grand total of none,” he admitted, showing viewers around the empty BBC office. BBC Breakfast airs daily at 6am on BBC One, while Football Focus airs Saturdays at 12pm on BBC One.